�����We are about to enter the last month of 2010 and the majority of activity is in Gold, Silver, and Platinum related items. Teletype dealers are constantly running messages associated to buying and selling Eagles, Silver Dollars, Silver and Gold bars, 90% silver coins and just about any kind of scrap that contains precious metal.The latest wholesale price for the one ounce Proof Gold Eagle in the original government box is $1,565. This is down from its high of just over $2,100 about six months ago. The 2009 UHR is trading at $1,775 in the original package. 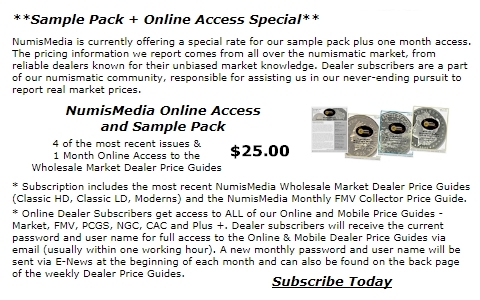 �����There are a substantial number of advances in this week's Moderns Wholesale Market Dealer Price Guide. Modern Eagles show numerous increases with Gold higher since the last printing. Demand remains quite strong for the 1986 through 1992 $25 Gold Eagles. Buyers are looking for most anything from MS65 quality through MS70. Large quantities are needed for most of these dates. However, there is a slight decline in Mint State $100 Platinum coins with the bullion actually lower in this issue. Proof Platinum coins have increased over the last month. Gold Commemoratives, both $5 and $10, have increased in most grades. Most of the $5 Gold does not have much premium anymore in MS70 or PR70. There have been enough coins certified in these grades to make them common and they are trading for less than $400 each wholesale. �����Even Modern Lincoln Cents are showing some life in the higher grades. Several increases are found in the MS66 and 67 columns. The 1937 S MS67 Red now has a Market price of $240 and the 1935 S is up to $240 in MS66 Red. There is continued interest in Proof Lincoln Cents, with the 1916 RB in PR65 now up to $4,050. These early Proofs always attract attention when they are available. In the Proof and Mint Sets chart, numerous advances are representative of an increase in Silver so the related sets are higher. The 1962 through 1964 Mint Sets have received lots of bidding activity over the last few weeks.